This beastie painted in a church at Wenhaston, Suffolk, in the 1500s is featured in a page on Late Medieval Dooms that is one of several interesting pictorial essays at the Ecclesiological Society. 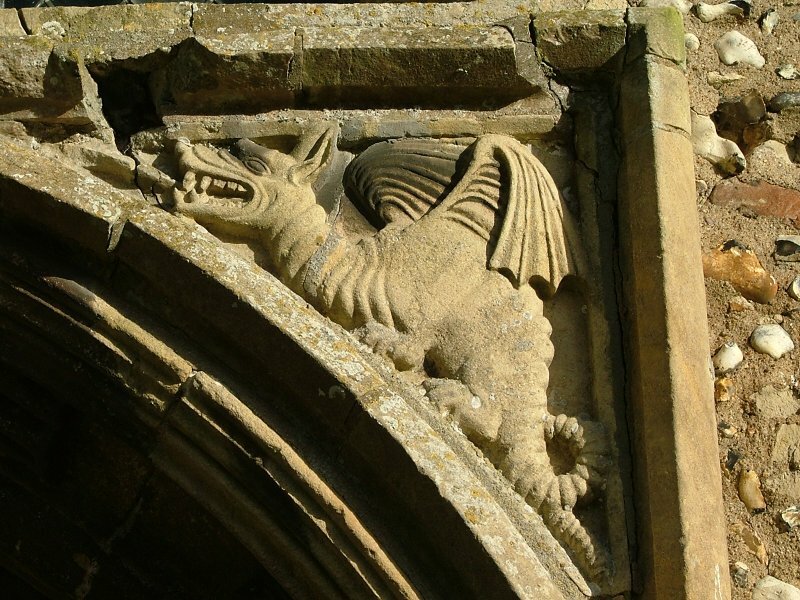 A gargoyle at Cratfield is pictured at a remarkable online chronicle of Suffolk churches compiled by Simon Knott. "Churchcrawling as guerrilla warfare," is how the project has been described. Meantime, English country churches profiled at Sylly Suffolk include St. Andrew, Norton, site of "unicorns, two martyrdoms, and a bottom well-spanked." Matthew at the Holy Whapping on Nov. 27 has lots on sirens and mermaids, while noting discerningly, re the Thanksgiving decorations at S. Clement's in Philadelphia, "squash and sub-tractarianism don't quite go together as well as people suppose." A biography of Fr. William Doyle, SJ, has been reprinted, John Cahill reports in a Nov. 30 post. Meantime, today is the feast of Jesuit martyr St. Edmund Campion, notes Xavier Letter. Fr. Francis Sweeney, SJ, founded a humanities lecture series at Boston College that over the years drew the likes of TS Eliot, Robert Frost and Alec Guinness to campus. Here's Samuel Eliot Morison signing the guestbook. An online exhibit on the late Fr. Sweeney includes a pic of him as a novice at Shadowbrook and an image of his ordination by then-Archbishop Cushing that is quite POD.